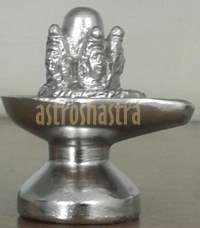 How to perform Puja on this shivling? What are the benefits of placing it at home/office? Shiva, is usually represented as a phallic symbol of the 'linga', which represents the energies necessary for life on both the microcosmic and the macrocosmic levels, that is, the world in which we live and the world which constitutes the whole universe. In a Shaivite temple, the 'linga' is placed in the center underneath the spire, where it symbolizes the naval of the earth. 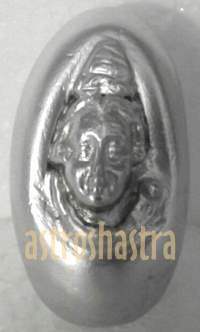 Shiva lingam made of Mercury and silver in solidfied state is called Parad Shivling. It is very solid and heavy. Normally Mercury neither dissolves in water nor does it stand at one place when one puts ones hand on it. the mixture of Mercury, herbs and silver solidifies in the form of LINGA. It is a very rare Lucky Charm. This LINGAM when kept in the Sun radiates rainbow colours. It is belived that even by touching the energised mercury linga, one's sins are removed. 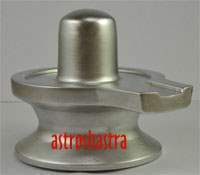 It is recommended by our saga's to adore and worship this lingam. This lead them to be infused with extra ordinary velour invincibility, adding to their fame and popularity far and wide, causing and spreading almost whole over the world. It is best recommended for Peace, prosperity and happiness. It is not only matchless but also unparallel in whole world. Mercury has property of liquidity which in itself involves difficult process of solidification. But by the grace and compassion of Lord Shiva lingam is made for the benefit of people of the world for peace and prosperity. 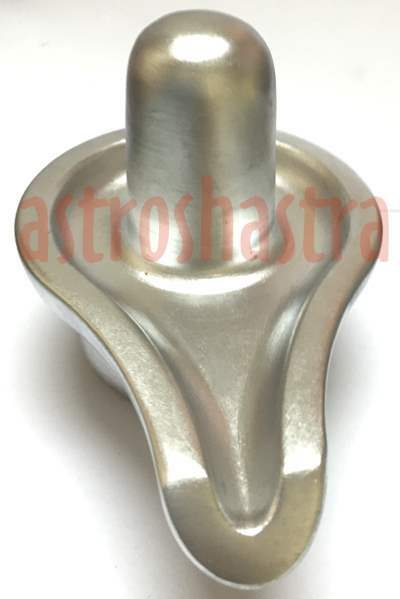 It is regarded as the sperm (seed) of Lord Shiva and in Ayurveda it as a flowing metalloid (fluid metal). It is said in Brahma Purana that he who worships it devotedly, whether one is male or female, Brahmin, Kshatriya, Vaishya or Shudra gets full wordly pleasures, and at last attains supreme destination (salvation). During life-span they get glory, honour, high office, name and fame, sons, grandsons and learning. o	It brings Prosperity to the house or office. o	There is no shortage of food, money or clothes in the house. o	It brings peace to the premises. o	It helps in controlling various disease like, high blood pressure, asthama and heart problems and help to increase your will power. o	Puja it with Ganges water and sprinkle it on a person or in a premises. Malefic planetery effects and black magic evils disappear. o	Ancient garanths (book) like Ras Ratnakar, Ras Chandasu, Samhita, Rasendara Chudamani, explains that by the very touch of it, a person gets the benefit of Shiv pooja in all the cosmic worlds. o	It Removes Vastu Dosha, grah peeda and fulfill four goals in human life-religion, health, desire, and salvation. 1. For the attainment of wealth, one should do pooja with lotus or bilva leaves. 2. Those desiring moksha (salvation) should do pooja with one lakh Darbha grass. 3. Those who offers one lakh bilva leaves to the Lord, shall have his each and every desire fulfilled and will not face shortage of any thing. 4. Those who offers one lakh sesame seeds to the Lord shall be relieved of their sin. 5. For regaining vigour and vitality offer one lakh ‘Urad (black gram)’ to Lord Shiva. 6. If abhisheka (giving bath) is done with Ganga water, one will get a son if necessary. If ghee of cow is used for abhisheka, there will be increase of Family members. If cow milk mixed with sugar is used for abhisheka, the Saadhaka shall enjoy love and peace in the house. 7. If abhisheka is done with Ether (perfume), one will enjoy all kinds of tasty food. Maalathi (a kind of creeper that yields very sweet smelling flowers). Astroshastra , ensures that it is Complete with 8 Sanskaars (8 stage of Purifications done as per Parad Sanmhita) and removal of Saptakanchuki (100 % medicated and hygienic). It will give fruitful results regarding Vastudosha, Grahapeeda, Court matters, Bussiness, sevice, Success in Studies, Health, Wealth, , Peace and Harmony. 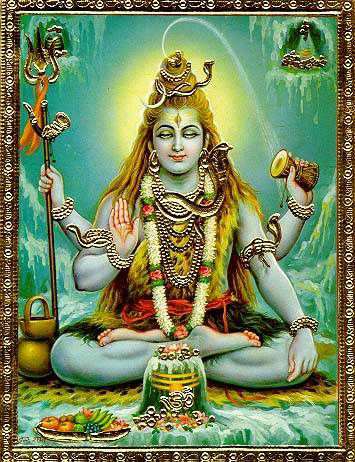 Offer devoted worships to Lord Shiva and put forth your desires and difficulties of life in front of him.